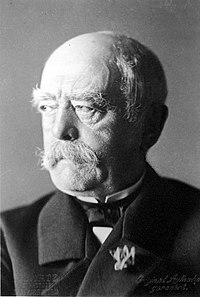 Hi Otto Eduard Leopold, Prinsipe han Bismarck, Duke han Lauenburg, Konde han Bismarck-Schönhausen, nga natawo ha ngaran nga Otto Eduard Leopold von Bismarck-Schönhausen (Abril 1 1815 – Hulyo 30 1898), amo in Pruso ngan Aleman nga tawo-han-estado han ika-19 nga siglo. Komo Ministro-Presidente han Prusya tikang han 1862–90, hiya an nagplano han pagkausa han Alemanya. Tikang han 1867 ngan sunod, hiya an Kansilyer han Konfederasyon nga Amihanan Aleman. Han pagdeklara han ikaduha nga Imperyo Aleman han 1871, nagsirbe hiya nga amo an syahan nga Kansilyer hini, ngan nakakuha hiya han agnay nga "Puthaw nga Kansilyer". Crankshaw, Edward (1981), Bismarck, The Viking Press. Feuchtwanger, Edgar (2002), Bismarck, Historical Biographies, Routledge, http://www.questia.com/PM.qst?a=o&d=108426285, 276 pp., basic starting point. Heuston, Kimberley Burton (2010), Otto von Bismarck: Iron Chancellor of Germany, Franklin Watts. Hollyday, FBM (1970), Bismarck, Great Lives Observed, Prentice-Hall. Kent, George O (1978), Bismarck and His Times, http://www.questia.com/PM.qst?a=o&d=7561027. Kissinger, Henry A (31 March 2011), "Otto von Bismarck, Master Statesman", The New York Times, http://www.nytimes.com/2011/04/03/books/review/book-review-bismarck-by-jonathan-steinberg.html?_r=1&nl=books&emc=booksupdateema1. Ludwig, Emil (1927a), Wilhelm Hohenzollern: The last of the Kaisers, New York, http://books.google.com/books?id=ghlSoo9pEUcC&printsec=frontcover&dq=Wilhelm+Hohenzollern:+The+last+of+the+Kaisers&hl=en&ei=iuVyT8P8IaWy0AHM7LyOAQ&sa=X&oi=book_result&ct=book-thumbnail&resnum=1&ved=0CDkQ6wEwAA#v=onepage&q&f=false, popular. Pflanze, Otto (1971) , Bismarck and the Development of Germany, I. Bismarck and the Development of Germany: The Period of Unification, 1815–1871, http://www.questia.com/PM.qst?a=o&d=33732682; 3 vols., 1963–90. Taylor, AJP (1969), Bismarck: the Man and the Statesman, New York: Alfred A Knopf, http://www.questia.com/PM.qst?a=o&d=14683010. Blackbourn, David (1998), The Long Nineteenth Century: A History of Germany, 1780–1918. Holborn, Hajo (1969), "The Constitutional Conflict in Prussia and the Early Years of the Bismarck Ministry", The History of Modern Germany 1840–1945, pp. 131–72. ———————— (1969), "The Founding of the New German Empire, 1865–71", The History of Modern Germany 1840–1945, pp. 173–229. ———————— (1969), "Bismarck and the Consolidation of the German Empire, 1871–90", The History of Modern Germany 1840–1945, pp. 233–97. Retallack, James N (2008), Imperial Germany, 1871–1918. ———————— (1978) (ebooks), German liberalism in the ninetury century, University of Chicago Press; ACLS, http://hdl.handle.net/2027/heb.01317.0001.001, behind a paywall. Beck, Hermann (1995), Origins of the Authoritarian Welfare State in Prussia, 1815–1870. Field, WG (October 1898), "Bismarck's First School", The Journal of Education (Oxford University Press) 20: 603–4, http://books.google.com/books?pg=PA603&id=MiwnAAAAMAAJ. Gross, Michael B (2005), The War against Catholicism: Liberalism and the Anti-Catholic Imagination in Nineteenth-Century Germany. Kennedy, Paul M (1988), The Rise of the Anglo-German Antagonism, 1860–1914. Ross, Ronald J (1998), The Failure of Bismarck's Kulturkampf: Catholicism and State Power in Imperial Germany, 1871–1887, The Catholic University of America Press, 219 pp. Sigerist, Henry E (1999) , "From Bismarck to Beveridge: Developments and Trends in Social Security Legislation", Journal of Public Health Policy (JSTOR) 20 (4): 474–96, http://www.jstor.org/stable/3343133. Frankel, Richard E (2005), Bismarck's Shadow. The Cult of Leadership and the Transformation of the German Right, 1898–1945, ISBN 1-84520-033-0, 222 pp. ———————— (2005), The Bismarck Myth: Weimar Germany and the Legacy of the Iron Chancellor, ISBN 0-19-928184-X, 216 pp. Müller, Frank Lorenz (2008). "Man, Myth and Monuments: The Legacy of Otto von Bismarck (1866–1998)". European History Quarterly 38 (4): 626–36. doi:10.1177/0265691408094517. Pearce, Robert (March 2010), "The Austro-Prussian War", History Review (66). ————————, Thoughts and Reminiscences, II, Google Books, http://books.google.com/books?id=IkgKAAAAIAAJ&pg=PA1&dq=inauthor:Otto+inauthor:von+inauthor:Bismarck&as_brr=1#PPR3,M1. ————————, Memoirs, II, Archive.org, http://www.archive.org/details/bismarckmanstate02bismuoft. Ini nga pakli kataposan nga ginliwat dida han 08:43, 28 Enero 2015.